Location menu may differ. This one is the Anaheim, CA one. Click here to view your location. The Jumbo Deal may not be the healthiest meal, but it is indeed a frugal deal! Click here for the linkThank you OC Deals for the heads up! Where: Participating The Coffee Bean & Tea Leaf® store locations* *Only valid at participating The Coffee Bean & Tea Leaf® store locations in CA, AZ and TX. Exclude Ralphs locations. 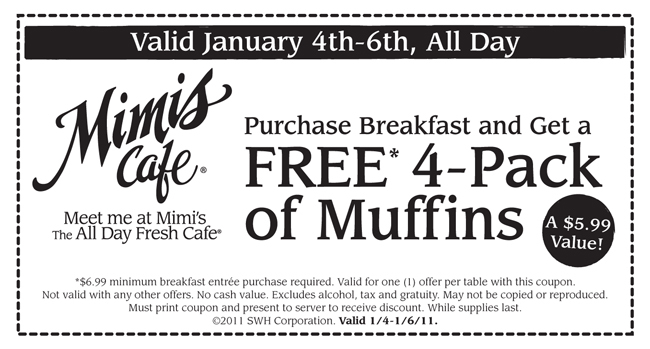 Valid only on January 4, 2011 from 4pm to 7pm. Offer applies to one (1) 12oz. Scottish Breakfast Tea Latte, one (1) 12oz. English Breakfast Tea Latte, or one (1) 12oz. Vanilla Latte. Only No Sugar Added Powder substitution allowed. Cannot be combined with other offers.Limit one complimentary drink per customer.